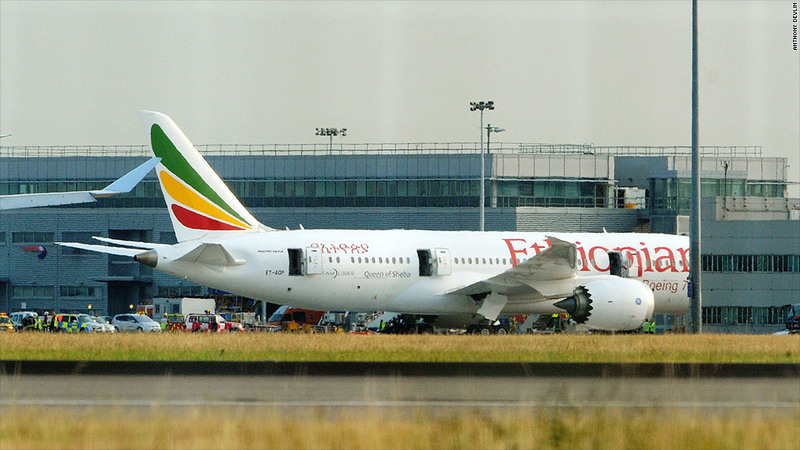 Burning Boeing Dreamliners are back in the headlines after this empty Ethiopian Airlines 787 caught fire at Heathrow airport. The cause of the fire is still unknown. Just when Boeing thought its Dreamliner problems were over, the company faced a fresh crisis Friday when an empty 787 caught fire at London's Heathrow airport. No injuries were reported, and the cause of the fire on the Ethiopian Airlines plane isn't yet clear. But the incident puts Boeing's marquee 787 Dreamliner fleet back in the headlines after it was grounded earlier this year because of a fire risk associated with the planes' batteries. On Saturday, the U.K. Air Accidents Investigation Branch said it didn't appear that the fire was related to the jet's batteries. The branch called for an investigation and invited government air safety divisions from the U.S. and Ethipia to join in. So far, it's unclear what caused the fire. On Fruday, Boeing (BA) shares sank 3.6% on the news. Boeing said it was "aware of the event," adding: "We have Boeing personnel on the ground at Heathrow and are working to fully understand and address this." Mary Schiavo, a lawyer and former inspector general at the Department of Transportation, said Boeing staff likely "have their fingers crossed that it's not the battery" that caused Friday's fire. "If it is the battery, the Federal Aviation Administration will be reevaluating the decision to let them fly again," Schiavo said. An FAA spokeswoman said the agency had dispatched an official to Heathrow to assist in investigation of the incident. Another Dreamliner flying out of the United Kingdom and operated by Thomson Airways was forced to turn back Friday after what the airline called "a technical issue." Thomson did not provide additional information about the problem. The 787 Dreamliner represents a new generation of efficient wide-body, long-range aircraft, and Boeing has placed a big bet on the fleet. Customer demand for the Dreamliner has remained solid despite the grounding earlier this year. The plane's lightweight design -- using composite material rather than aluminum, and wires instead of some of the hydraulics -- allows it to be far more fuel-efficient than earlier models. Fuel is the most expensive cost for most airlines. Although Boeing has delivered just 68 Dreamliners to customers to date, it has 862 unfilled orders. Boeing says it plans to increase Dreamliner production to 10 per month by the end of 2013, up from five per month earlier this year. The first of the long-delayed Dreamliners went into service for Japan's All Nippon Airways in October 2011, and the planes flew without major problems for more than a year. But after the battery problem emerged in January, the company had to retrofit the 50 Dreamliners already in service before they could return to the skies. Despite these problems, investors haven't been too worried. While Boeing shares slid Friday, they're still up more than 30% since the start of 2013. CNN Wires staff contributed to this report.